In the 3D prism-patterned display, the angular prism screen reflects different light pixels to each eye, which creates a sense of depth through parallax. Image credit: Wallen Mphepö, et al. 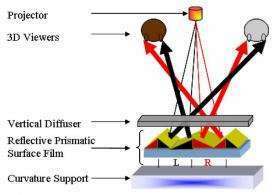 (PhysOrg.com) -- A team of engineers from Taiwan seems to have overcome one of the most persistent challenges of 3D display technology, which could enable them to produce a cinematic 3D display with superior quality compared to most current systems. Their proposed design combines a prism-patterned projection screen with advanced projection technology to achieve both high optical efficiency and low image crosstalk -- two properties that have been considered mutually exclusive until now. The researchers, led by Wallen Mphepö from National Chiao Tung University in Hsinchu, Taiwan, and Chalmers University of Technology in Göteborg, Sweden, have published their proposed 3D display design in a recent issue of IEEE's Journal of Display Technology. The new display uses a prism-patterned 3D screen, a technology which has previously been explored to varying degrees of success. In this system, the prism’s angular surfaces reflect light at two different angles, which are received by a viewer’s left and right eyes, creating a sense of depth through parallax. The prism screen can display 3D images to multiple viewers, as long as they are located within a specific distance range from the screen. The system is also autostereoscopic, meaning viewers do not need glasses to see the 3D effects. The key to prism-based 3D displays is that the prism screen must effectively separate the left and right image pixels. To achieve this pixel separation, the researchers worked on defining the prism angles as well as the curvature of the entire screen, which is necessary in order to keep the rays within the viewing zone. To derive the curvature’s coordinates, the researchers used an iterative process, with each new point on the curved surface computed based on the previous points’ locations. The initial results of their simulations showed a large amount of crosstalk between left and right viewing zones, meaning that the right eye could see some residue of the image intended for the left eye, and vice versa. In order to minimize the crosstalk, the researchers reconfigured the prism angles to sharpen the reflected rays’ separation. In addition, they slightly increased the inter-ocular separation (the distance between a viewer’s eyes) from 65 to 70 mm, and moved the viewing location to 1.15 m, 50 mm closer to the screen. These measures reduced the amount of overlap between left and right pixels, virtually eliminating the crosstalk. However, as the engineers note, it’s not the 0% crosstalk that makes the 3D display innovative, but rather the fact that the display also operates at 90% optical efficiency. As Mphepö explained, previous technologies have always assumed that image crosstalk is inversely proportional to optical efficiency. 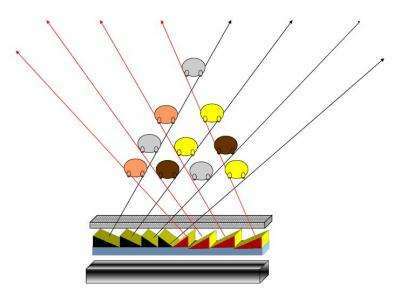 For instance, as Mphepö explained, a typical autostereoscopic 3D display might use a parallax barrier - a layer of opaque material with slits that is placed in front of the screen, allowing each eye to see a different set of pixels. If the slits are wide, more light can pass through, which increases the optical efficiency. However, wide slits allow more image crosstalk, since each eye sees more light that is intended only for the other eye. On the other hand, making the slits narrower can reduce image crosstalk, but also blocks most of the light, reducing optical efficiency. Thus there is an inherent tradeoff between optical efficiency and crosstalk in such a design. To overcome this problem, the new system replaces the parallax barrier with fine-tuned prisms that, as Mphepö explained, reflect light to create a “sweet spot” with high optical efficiency and virtually no crosstalk. By increasing the number of prisms per pixel, the 3D prism-patterned display can accommodate many viewers simultaneously without a dramatic loss of resolution. In the version shown here, four prisms per pixel generates 10 3D viewing zones in four rows. Image credit: Wallen Mphepö. Although the 3D viewing zone is currently somewhat small, the design has another important advantage, in that it can be configured to provide several 3D viewing zones without drastically reducing the image resolution. This ability contrasts with other autostereoscopic 3D displays, such as those that use a parallax barrier and those that are based on a lenticular lens, which is what most of the major manufacturers are using today. In both designs, the method of increasing the number of viewers involves dividing up the pixels among viewers, which decreases each viewer’s image resolution - especially for a large number of viewers. As Mphepö explains, in the prism-based design, the resolution of each individual viewer is reduced by at most only half of the projector's original resolution, no matter how many viewers are added. Instead of dividing up the pixels, the system increases the number of prisms per pixel to accommodate more viewers. In this way, using only 11 prisms per incident projector pixel, the system can accommodate 100 simultaneous autostereoscopic 3D viewers. “The fabrication process is orders of magnitude simpler, while the number of views that can be generated is much higher and makes cinema autostereoscopic systems more feasible,” Mphepö said. He also added that part of the inspiration for the design came from bouncing off ideas with Professor Michael Bove, Jr., at MIT Media Labs, who is the co-director of The Center for Future Storytelling. The design still needs work in some areas, such as optimizing the system for an inter-ocular distance of 65 mm, which is considered the ideal distance for most viewers. The researchers also plan to increase the stability and size of the 3D viewing zones to allow for more head movement. THis is an awesome article - just for the sheer detail and thought that went into writing it. It doesn't assume a stupid reader and answers all basic questions about design. I do not watch much tv - but i would be interested in see a demo of this. Screwed around with these 5 years back for augmented displays in medical contexts (overlay of 3D information during keyhole and microscope surgery). The problem is that the prism structure is 2D. it allows for a shift of the head on the X-axis and will give a good '3D feel'. But shifting on the y-Axis does nothing - and therein lies the problem. When you watch 3D stuff you want to move your head in all directions unconsciously - and the lack of 3D effect in y-direction which will break the immersion. In the above situation you might even fall out of one viewing zone into another which would give you a very uncomfortable feeling of suddenly 'jumping to the left' with your last fractional head movement to the right. Nice toy, no doubt, but limited applications. What are those colorful little creatures sitting in front of the TVs? Furbies? they could try to create an interlaced pattern of these prisms, alternating between up/down and left/right orientation, i wonder if that'd solve the problem. You'd need prisms in all psooible viewing directions and for all possible viewing positions. I don't think that would work too well. This is almost like a screen technology I designed 24 years ago but they're missing one crucial detail that makes it a lot better. that being....? Or if this is some super-secret idea, you should probably present it to them. I have been aware of this technology for over 20 years too. There is such a thing as being too early with technology. That is a far more likely explanation of why it didn't take off two decades ago. I have also seen autostereoscopic devices based on a fresnel lens with a conventional lens inset. Made no sense, but I built one and it worked. @pubwvj: you should do somnething with this. Hmm. This reminds me of my old 3-D baseball trading cards from the 70's. Anyone want to trade for a Willy Mays? This technology is already on the market: it was demo'd by one of the major screen makers weeks ago .. I forget the maker, but the screen didnt need glasses for 3D .. It's hard for me to feel that the viewing experience is worth it .. I imagine that viewing angles/head position would have to be restricted .. but then, i wasn't there. Exactly! What ever happened to the LCD glasses, in which left and right would have no problem being controlled for 3D effect. The glasses were said to give the effect of watching a giant screen TV. Well this would probably work quite well for computer monitors where you really don't change orientation much. Oh yea, well... I just discovered how to travel from here to mars in 10 seconds, but I am not going to tell you how it works or give any convincing evidence, but I am going to think about patenting it because telling you that legitimizes the claim.